This is a short step by step guide on how to enter an order as a reseller. If you are not already a reseller and want to become one then you should go to the reseller page. Open the purchase page and click the product you want to purchase. That will take you to the shopping cart. Enter the quantity and press the Update button. 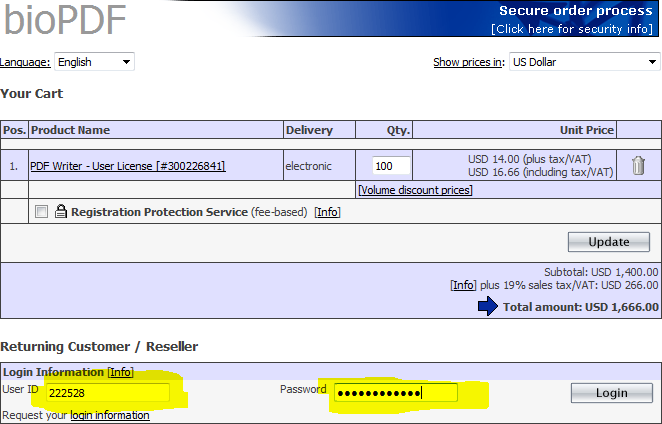 Enter your reseller login and password and press login. Verify that the correct discount is shown before you continue the purchase. 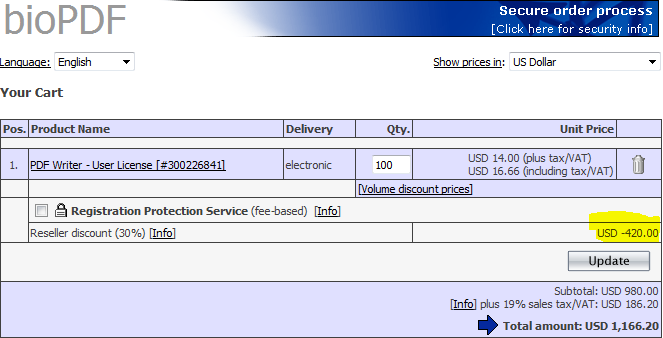 Select the payment method and follow the checkout procedure. If you cannot find your reseller login information then you can click the login information link below the input field for the User ID. It is important that you make sure that total amount is correct before you place the order. If something looks strange then you should contact us before you continue.